Will 'ubering by air' be the next big thing? Ridesharing company Uber has unveiled a new prototype vehicle designed to alleviate urban congestion by flying passengers to their destination. Representing Uber’s vision of the future of transportation, the new electric vertical take-off and landing (eVTOL) vehicle is a cross between a helicopter and a drone, and has been developed to improve global mobility. 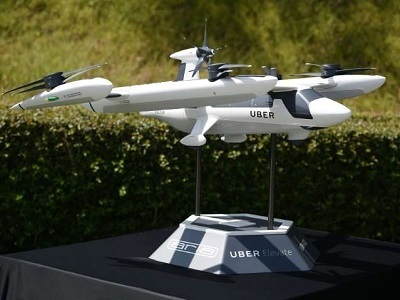 Uber Aviation product chief Nikhil Goel said that the all-electric flyer can achieve speeds of over 300km/h and has a range of 100kms on a single battery charge. He added that they can prove to the FAA as well as the public about the safety aspect of the aircraft. The ‘flying taxi’ was displayed at the second annual Uber Elevate Summit in Los Angeles recently. While the first demonstration flights are planned for Los Angeles in 2020, Uber aims to commercialise the concept in 2023. The flying taxis can be ordered on demand similar to a ridesharing vehicle. According to Eric Allison, who heads Uber's Aviation programs, the low cost flying vehicles will allow people to live without personal cars. Though flying taxis will be initially designed with a pilot, over time, they can be developed as autonomous vehicles.